Smart sellers can make social media work for them by building a personal brand, giving value, connecting with others, and growing their business. 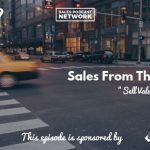 Andy Storch is a consultant and coach who is always learning new things about sales and who loves the freedom that selling provides. Though he says he still has a lot to learn, he has an advantage over many others because he’s always trying new things. Because he has the confidence to experiment and discover what works and what doesn’t, he has a leg up on a lot of other people. Whether you’re selling services or products, there are very few things that absolutely distinguish your offerings from other people’s. In fact, customers can always find an alternative. In B2B especially, they are buying you. They want to do business with you. Relationships are so important for sellers which is why it’s more important than ever to develop a personal brand. You must let people know who you are and create authority. To that end, Andy uses social media to let people know who he is, to create authority, to share knowledge, and to build authority. As sellers, we initially think we want to get on a call with everybody, but there are a lot of people we just won’t gel with. Social media attracts people who want to work with us and deflects others. In an era where everyone is creating content of some kind, we have to put our own content out there in order to build our authority. Given the amount of content that already exists, it’s tempting to wonder why yours matters. Even if you’re regurgitating information you learned from someone else, put your own spin on it. For some, it’s blogging. Others use podcasting or YouTube. It depends on your style and where your clients are. Andy points to podcaster Chris Ducker and his business Youpreneur. In his book Rise of the Youpreneur, Chris says that if you build a personal brand, it’s the last brand business you’ll ever need to build because you can take it with you and evolve it into any kind of business. Five years from now, you may do completely different work, but if you’ve built a brand and a following, people will go with you. Your personal brand is what you’re known for. Having your own website and your own colors is the advanced part of it. Are you known for being knowledgeable, trustworthy, and someone that people want to learn from? Andy posts on social media with the goal of helping his friends discover the things that have previously worked for him. They tell him that he inspires them, and he has created a personal brand as someone who is an achiever, who helps and inspires other people. You want to be known as someone knowledgeable and trustworthy at the end of the day. Think of your content as giving information to a friend. You are putting it out there for those people who need it and want it at that time, not for people who don’t. Don’t worry about the judgment from people that your content isn’t for. Most people are rooting for you. Even if the content isn’t for them, they’ll just scroll on by. Andy’s primary business is B2B so he spends most of his time on LinkedIn. When he moved to this business 18 months ago he committed to posting every weekday. Over time he has gained some traction there, though it’s a tough platform to engage on. Until you have a really good following of people, it’s tough to get likes and comments. Start by finding an engagement group where people are in a group together commenting on each other’s stuff. Be careful with this, though, because if you join multiple groups it can be tough to keep up. If you find one, it will help you build your following and gain exposure. It doesn’t directly turn into sales, but it keeps him top of mind for people. You don’t know who’s on there and who’s seeing your content. Don’t put content out just for the sake of doing so, but find ways to be valuable to the people who follow you. Don’t assume you’ll start generating sales right away. You’re serving people, you’re building a brand, and long-term it will work out for you. The best practice is to schedule content, but Andy calls himself a live-in-the-moment kind of guy who decides each day what to post. He alternates between providing content that targets his ideal clients and general content that would be helpful for larger numbers of people. His target clients are less than 10 percent of his overall network, so sometimes he wants to speak directly to them, but sometimes he wants to engage a larger group. Think back to your own experiences and knowledge. Can you turn those into posts or stories that you can tell Would you rather write or speak? You’ve got to put it out there are hit publish. You won’t get much response in the beginning but you’ve got to keep doing it. When you have a fear of judgment or criticism, it grows as you let it fester. The more you take action, just like with cold calling, you build more experience so it becomes less scary. Andy has two podcasts: The Andy Storch Show and The Talent Development Hotseat. He uses the latter to land meetings with target clients who otherwise wouldn’t meet with him, and it’s working beautifully. Everyone loves to tell their own story and they love attention. Many people don’t know how to do that because they aren’t going to start their own podcasts. Andy gives them a way to share their stories and experiences. The same people who failed to accept sales meetings with Andy suddenly accepted the offer to appear on his podcast. He’s working to develop personal relationships with these people. These people didn’t see a compelling reason to interact with him before they discovered his platform. The added benefit is that he’s growing his authority and building relationships. Resist the temptation to include lots of calls-to-action and links. Provide value. They want to know that you’re trustworthy and that you have interesting things to say. You can connect with Andy at his website, www.andystorch.com, and on LinkedIn. You can also check out his two podcasts: The Andy Storch Show and The Talent Development Hotseat. 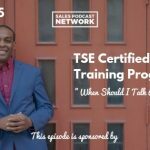 You’ve heard us talk about the TSE Certified Sales Training Program, and we’re offering the first module free as a gift to you. Preview it. Check it out. If it makes sense for you to join, you can be part of our upcoming semester in April. You can take it on your own or as part of the semester group. The program includes 65 videos altogether, and we just completed a beta group that helped us improve the program and maximize the information in it. If you and your team are interested in learning more, we’d love to have you join us. Call (561)578-1729 to speak directly to me or one of our team members about the program. This episode is also brought to you in part by mailtag.io, a Chrome browser extension for Gmail that allows you to track and schedule your emails. You’ll receive real-time alerts anyone opens an email or clicks a link.